Tarrington Village in Hatfield, PA is a lovely active adult community of attached homes. This age-restricted community in Montgomery County offers low-maintenance resale homes, perfect for 55+ homebuyers. Not only do residents enjoy the vibrant lifestyle and activities in Tarrington Village, they also enjoy its great location in Hatfield Township. Tarrington Village is a welcoming community that embraces the great outdoors. Although there is not an on-site clubhouse, residents have many ways to stay socially active and physically fit by taking advantage of the outdoor amenities. Residents often meet at the gazebo for summer picnics, ice cream socials, and more. Homeowners enjoy living in a four-season climate where they can stroll through the beautifully landscaped walking and biking trails. Developed by W.B. Homes between 2003 and 2005, Tarrington Village encompasses 79 townhomes. There were two floor plans offered: the 1,450 square-foot Wyndham and 1,472 square-foot Weyborne models. Each are complete with at least two bedrooms, two or three bathrooms, and an attached one or two-car garage. Every home offers a loft with different options that may include a den or office, extra bathroom, or studio space for guests. Residents of Tarrington Village live a carefree lifestyle without having to worry about the tiresome upkeep of a large home because an established homeowners' association (HOA) takes care of exterior home chores. The HOA fee includes snow removal and lawn care, giving residents time to enjoy community events. This tight-knit neighborhood often hosts social gatherings that include an annual garage sale, book exchange, holiday events, planned trips and excursions, lunch outings, brunch trips, pizza parties, and more. Tarrington Village is a 55+ neighborhood in Hatfield, Pennsylvania. The township of Hatfield is a lovely Philadelphia suburb that offers culture, recreation, and entertainment throughout the year. Events include the Winter Blast, Artisan and Heritage Fair, Hatfield Hat Trick Race Series, MusicFeast, Hatfield Township Golf Outing, and Rocktober Fest. With more than 100 acres of parks, residents of Tarrington Village enjoy endless options for outdoor recreation. When traveling farther from Hatfield, active adult homebuyers will be pleased to know that tax-free shopping in Delaware as well as the Philadelphia International Airport are both less than one hour away. Working adults and retirees alike will appreciate Tarrington Village s great location in Montgomery County, PA. There are plenty of activities available in Tarrington Village. Here is a sample of some of the clubs, activities and classes offered here. There are 79 townhomes within Tarrington Village. Built between 2003 and 2005, homebuyers can find a low-maintenance resale home that has about 1,450 to 1,472 square feet of living space. These attached homes were built with at least two bedrooms, two bathrooms, and an attached garage. Every home was built with a loft that includes options for a guest studio space, den, or storage space. I bought here because I wanted a small place I could easily take care of and still be close to my kids. I turned my loft space into a playroom and enjoy watching my new grand-daughter! I've made some good friends here and feel like it's a very safe neighborhood to live in. I haven't had any major problems with my house and I never have to worry about shoveling snow or yard work! 55places.com is not affiliated with the developer(s) or homeowners association of Tarrington Village. The information you submit is distributed to a 55places.com Partner Agent, who is a licensed real estate agent. 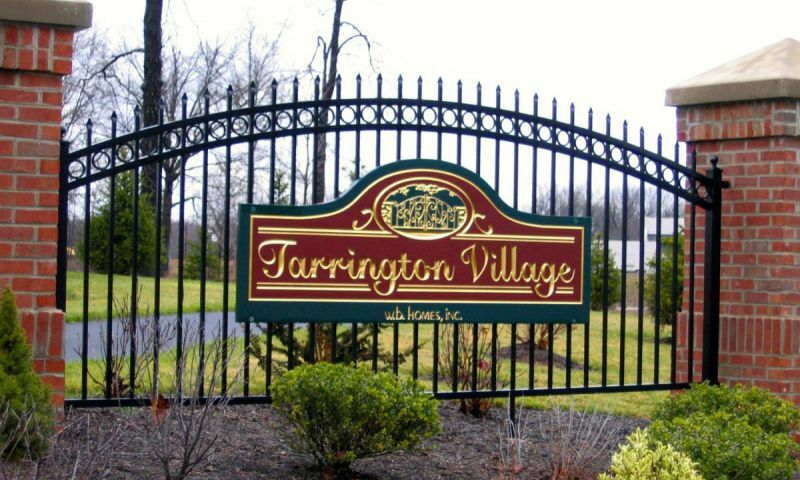 The information regarding Tarrington Village has not been verified or approved by the developer or homeowners association. Please verify all information prior to purchasing. 55places.com is not responsible for any errors regarding the information displayed on this website.